With Valentine's Day approaching, I have a suggestion that can mean more than flowers or chocolates (however, flowers and chocolates have planted a few seeds over the years). One of our most popular selling items over the many years has been PEPPER SPRAY, or TEARGAS as it has also been referred to. If you were to ask why, I would tell you that of all the self-defense weapons we stock and sell, PEPPER SPRAY is the most reliable, safest, effective, and practical weapon that works for the majority of the population...just ask the police that use it. After 40 years of martial arts, I know, like many of Ranger Surplus' customers, how all of our weapons function. My level of comfort with them is why we chose to sell them. However, not everyone is checked out on kubatons, knives, daggers, stun guns, brass knuckle "paperweights", tonfas, nunchucks, shurikens, bokens, batons, and whathavehaveyou, so again, PEPPER SPRAY makes sense. Also, most of the weapons that I mentioned require you to be physically close to an attacker, and if you are untrained, that puts you too close for comfort. With PEPPER SPRAY, if/when you sense a threat, you can dispense this less-than-lethal spray from 10 to 15 feet away, and it contains 25 one second blasts. We've had to use this in the past, and I can tell you personally, this stuff works! This will immediately blind an attacker, as well as make breathing difficult. With a blind and breathless attacker, you can make your escape - they won't be in pursuit at that point. These make practical gifts for any occasion, so if you love someone, show them that you care....and get one for yourself as well. I keep one on my truck's visor, and take a bear spray along when in the woods if I am without a firearm. The missus keeps one her car key chain so that she always has one on her, and you can get larger home versions to keep by the door. Joggers love them too, because they never know what's going to chase them. So there you have it...men or women, young or old, these are one of the best self protection weapons we sell, so think about that for Valentine’s Day. 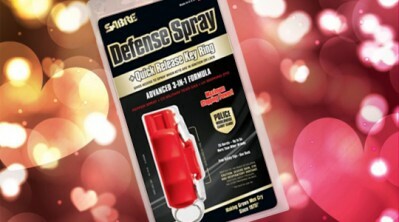 Chocolates and roses play their part, but have you ever tried beating an attacker senseless with a Whitman sampler? Currently, we're stocking 9 different styles and sizes from Sabre - the number 1 brand used by police and consumers worldwide, and they are ON SALE EVERYDAY! From key chains, clip style, joggers, home defense, practice canisters, and yes, even bear defense, we've got you covered (click on link). As always, it's better to have and not need, than to need and not have. Have a safe and wonderful Valentine's Day. We're here when you need us, and thanks for your support this, and every year. Now get out there and explore outdoor!